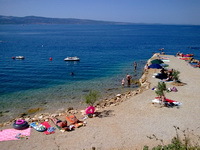 Nemira is a village between Omis and Makarska which is 3 kilometers south. It has 2 very nice and large gravel beaches with pine trees under which they find shady places. In the crystal clear water when you will swim will be enjoying very much. The village is located below the "Magistrale" coast road so that when you walk or on the way to the beach far enough away from the dense traffic. It is also an ideal holiday destination for the whole family. In the village you can find for her physical well-being several restaurants and some cafebars. On the beach to find even a Restaurant. The way to the beach to get to a tourist office where you can get any kind and useful informations. 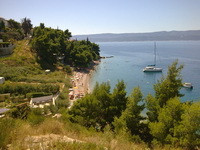 Special feature in Nemira is that its possible to walk along the sea until Omis.